As the temperatures begin to drop and the leaves begin to fall, many winter-blooming plants emerge to light up the garden with color. Grown in a wide range of colors, shapes and sizes, often the best winter plants are those that have a clumping growth habit that fills out the container for an attractive display. Lenten rose (Helleborus odorus "Double Queen") is a winter-blooming perennial flower that grows in USDA zones 4 to 9. It has a clumping growth habit and reaches a maximum height of 3 feet tall and has a spread of 1 to 3 feet wide, ideal for a hanging basket. The double, nodding-like flowers are deep pink to pale pink and white with a mattering of speckles throughout the petals. Frost-tolerant, Lenten rose tolerates below-freezing temperatures to provide a burst of color to the winter hanging basket. The deep green, lustrous, leather-like foliage on Lenten rose is deer-tolerant. Lenten rose grows best in part to full shade and well-drained, nutrient-rich soil that is neutral to alkaline. They are also tolerant of both heat and humidity, creating a hardy plant variety. To promote new growth the following growing season, cut back the flowering stems after they bloom. Giant snowdrop (Galanthus elwesii) is a perennial bulb that grows best in USDA zones 4 to 7. The common name, snowdrop, refers to the resemblance the flowers have to drops of snow. Giant snowdrops grow up to 1 foot tall and have a maximum spread of ½ foot wide. The single, waxy, 2 inch long, bell-shaped, nodding flower appears to be bowing down to the garden. The bright green, 1-and-¼ inch long narrow, basal leaves on giant snowdrops elongate to a 4 inch long leaf after it flowers. Located at the base of each bulb, giant snowdrops have two to three leaves per bulb. Giant snowdrops have a clumping growth habit that looks attractive within a hanging basket. They grow best in full sun to part shade and moist, humus-rich soil. Pansy (Viola x wittrockiana) is an annual flower that grows in winter for a vibrant burst of color to a hanging basket. It grows 8 to 12 inches tall and requires a 6-inch spacing for maximum growth. 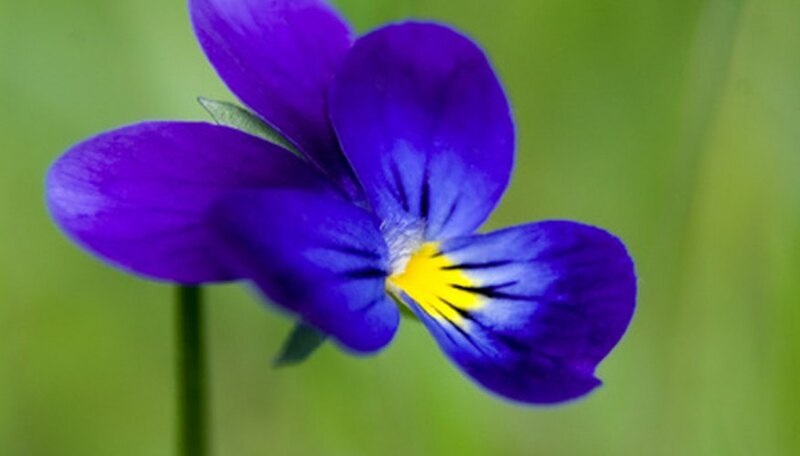 The fragrant, 2 inch wide flowers on pansies consist of two lateral petals, two upper petals and one lower spurred petal. Pansies grow in a rainbow of colors including, white, yellow, crimson, blue and variegated colors that have one color swirled together. They have a low-growing, clumping growth habit that looks attractive tucked into hanging baskets and attracts butterflies to the garden. The dark green, ovate to elliptic leaves on pansies grow up to 1-and-½ inches long. Pansies grow best in full sun to part shade and moist, well-drained soil. They grow in all USDA zones.